Have certain media personalities or bloggers been bad mouthing Fear Dept? We'd like to know. That's one reason we systematically monitor the activities of journalists and citizens active on social media. DHS Discloses NOC Monitoring Initiative. In a document posted to the Department of Homeland Security's website, the agency confirmed the existence of an extensive media monitoring program. Since at least 2010, DHS has been collecting personally identifiable information on "anchors, newscasters, or on-scene reporters who are known or identified as reporters in their post or article or who use traditional and/or social media in real time to keep their audience situationally aware and informed" and "current and former public officials who are victims of incidents or activities related to Homeland Security." 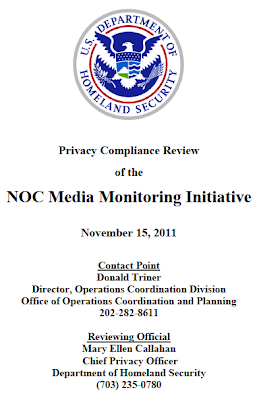 In-house media monitoring reports created by DHS are also being shared with private sector and international partners.